← Introducing Follow Me Fridays! Follow Me to… La Marqueta! El Barrio/East Harlem is home to one of our city’s most iconic cultural landmarks – the traditional marketplace known as “La Marqueta”. Located in the heart of El Barrio, this historic marketplace once served as our community’s social and economic center – a place where families from all over could come together to celebrate culture and buy foods and goods not available anywhere elsewhere in the city. Bringing the spirit of El Barrio back to La Marqueta and turning it into a bustling cultural, food, and recreational hub once again has been a top priority for me and many others. 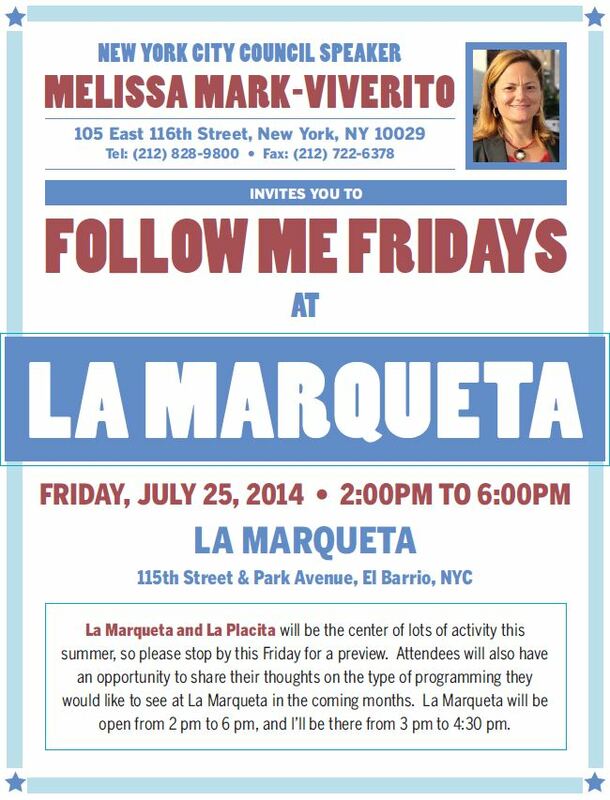 As part of these efforts, I would like to invite you to a very special Follow Me Friday this Friday, July 25th at the outdoor space known as “La Placita,” located at 116th Street and Park Avenue inside of La Marqueta. There will be live cultural performances and music, as well as pop-up booths featuring local designers, artists and jewelers. And as with previous Follow Me Fridays highlighting local destinations in our district, folks will have an opportunity to catch up with me while supporting some of the great local businesses working in our community. La Marqueta and La Placita will be the center of lots of activity this summer, so please stop by this Friday for a preview. Attendees will also have an opportunity to share their thoughts on the type of programming they would like to see at La Marqueta in the coming months. La Placita will be open from 2 pm to 6 pm, and I’ll be there from 3 pm to 4:30 pm. Subway – #6 train to 116th Street Station. There is a cross-town bus on 116th Street, and there are North & Southbound buses on 3rd, Lexington and Madison Avenues nearby. Thanks and I look forward to seeing you this Friday! This entry was posted in East Harlem, Events. Bookmark the permalink.